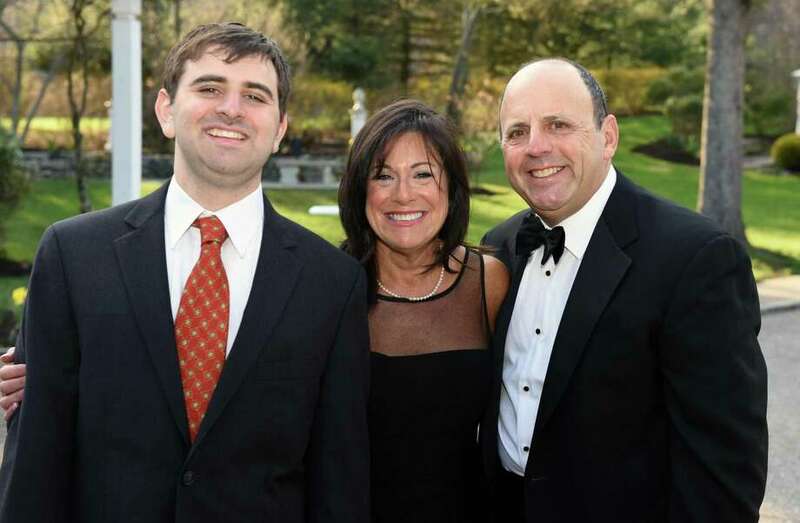 From left, Eric Parkes joined his parents, Penney and David Parkes, of Fairfield, at Ability Beyonds Masquerade Gala fundraiser on April 28 in Danbury. The Parkes served as co-chairs of the event. The Fairfield Museum, 370 Beach Road, is hosting a family party on May 18 from 5:30 to 7:30 p.m. in conjunction with its new exhibition about the Culper Spy Ring. Enjoy food trucks, games and activities for kids of all ages. Spy costumes and disguises are encouraged. The third annual party will help support free educational programs throughout the year. Tickets are available at Fairfieldhistory.org/events/spy-party/. For information visit Fairfieldhistory.org or call 203-259-1598. The town of Fairfield Shellfish Commission will host its annual Clam Clinic event at Sasco Beach, 1401 Sasco Hill Road, on Saturday from 8 to 10 a.m., for local residents to learn about Fairfield’s natural shellfish resources. The event will happen rain or shine. Participants will have the opportunity to learn harvesting techniques, keep their own catch and sample local chowders. Gear, including clam rakes, buckets and gauges will be available for use. All are encouraged to bring towels and footwear for the water. Parking is limited, so carpooling is suggested. The Sasco Beach shellfish bed was recently restocked with more than 9,000 clams for residents to harvest. The event is free and a shellfishing permit is not required. Permits will be available for sale at the event for future use. For information, contact the Fairfield Conservation Department at 203-256-3071. Connecticut Audubon Society’s owl ambassadors will show off their adaptations for night hunting on Friday from 6:30 to 7:30 p.m. at the center Friday May 18, 6:30-7:30 p.m. at the center in Fairfield, 2325 Burr St. Learn the unique physical and behavioral adaptations of owls, as well as their habitats, diets, calls and tips on how to spot them in the wild. CAS members: $5; nonmembers: $10. Registration required at www.ctaudubon.org/Fairfield-home, or call: 203-259-6305, ext: 109. Ability Beyond raised $700,000 for those with disabilities during its annual Masquerade Gala on April 28. The black-tie event took place at the Amber Room Colonnade in Danbury, attracting close to 500 guests. Celebrity comedian Christine O’Leary entertained guests as the emcee and co-host of the live auction, along with Ridgefield First Selectman Rudy Marconi. A few of the auction items included vacations, artwork and tickets to performances of “Hamilton,” “Phantom of the Opera” and Bon Jovi. Robert Bedoukian was presented with the Robert S. Young Humanitarian award for his volunteer contributions to Ability Beyond and Roses for Autism. All proceeds from the event will be used by the nonprofit to continue providing job training and placement, supported living, and recreational and educational opportunities to clients in Connecticut and New York. For information about Ability Beyond, go to www.abilitybeyond.org. The following Fairfield residents were recently initiated into the Honor Society of Phi Kappa Phi, the nation’s oldest and most selective collegiate honor society for all academic disciplines. Nancy Dickison, Trevor Doherty and Devon Keehan were initiated at University of Bridgeport; Emma Pippert was initiated at Elon University and Eric Winjum was initiated at Ohio University. Khaila Fitzgerald, of Fairfield, was inducted into the Alexander Graham Bell Honor Society at Curry College. Fitzgerald was one of 53 students inducted during ceremonies on the college’s campus. Founded in 1971, the objective of the Alexander Graham Bell Honor Society is to promote and recognize academic excellence at Curry College. The society is named after Bell, the famous inventor who was an early chancellor at Curry College. Members serve as a resource for the academic deans and the faculty and recommend ways the academic environment of the college can be enriched. Membership in the society is limited to 10 percent of the senior class and 5 percent of the junior class, and all members must have a minimum 3.5 GPA overall and the required number of graded credits. For information about the Alexander Graham Bell Honor Society, visit the Alexander Graham Bell page on the college’s website. Fairfield Warde High School’s Parent Teacher Association will host an outdoor flea market on May 20 from 8 a.m. to 3 p.m. at the school, 755 Melville Ave. The event will feature a wide variety of vendors and items, including antiques, vinyls, coins, crafts, jewelry, clothing, and other items new and used. Vendor booth fees from the flea market support PTA programs and scholarships. Rain date is May 27. The flea market is a recurring event that takes place the third Sunday of each month from April through October. For information, visit fwhspta.org or fwhsfleamarket@gmail.com.